Musing on the baker’s art, Marcella Valladolid, one of the judges on The American Baking Competition, says “You can’t put a cake in the oven and walk away. You have to be there. You have to watch it.” This show looks as if somebody put it in the oven, left the house for cigarettes, and forgot to go back. Even for network summer TV, this is one drowsy hour of television, doughy and shapeless as well as lacking in any nutritional value. You get a sense of just how out of touch the show is, and how hopeless it’s going to be at pulling any surprises on viewers, during Jeff Foxworthy’s introduction. “We scoured the country for America’s best amateur bakers,” he drawls, “and you won’t believe where we found them.” In homeless shelters? Camped out on the White House lawn? Working as line cooks in five-star New York restaurants? Nope, in firehouses and law offices, and—brace yourself—“Even down on the farm!” Earth to Jeff Foxworthy: When a network hires you to host their new cooking competition show, that’s the official announcement that there will be contestants who were found down on the farm. The show would have a studiously down-home, folksy flavor even if most of the contestants were on loan from the Vatican, because the bakers do their baking in what looks like a barn that’s been converted into a gazebo and decorated with items purchased from the nearest Cracker Barrel—lots of miniature American flags and old-fashioned logo signs. Foxworthy himself brings nothing to it; casually dressed and looking as if he weren’t being paid enough to bother to stand up straight, he acts like somebody’s uncle, the tired-looking old guy who sees family gatherings at Christmas as a chance to remind everyone that his lodge buddies have always said he could have been a professional comedian, at least until his wife gives him a look from across the room. If someone serves a pie with bourbon in it, rest assured that Foxworthy will not pass up this golden occasion to do his slurred-speech Foster Brooks routine. Mostly, though, he’s easy to forget about. His presence here may be the first thing in more than 10 years that’s reminded me of Butch Lockley, a contestant on the sixth season of Survivor, whose uniquely uncommitted playing style led to allegations by some online commentators that he must have been vacationing in the Amazon when a TV crew showed up and filmed a Survivor series around him. Unfortunately, no matter how much fun the judging is on a show like this, it’s a sterile exercise if you don’t care who wins. 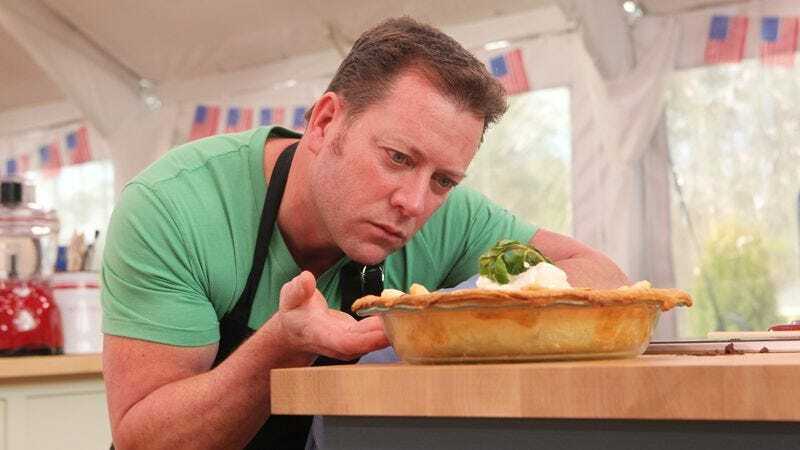 The makers of American Baking Competition haven’t mastered the knack of framing the contestants so that they come across as characters in whose fates we can form a rooting interest. They’re just faces with little identifying factoids attached to them: A woman who says that she’s “not your average grandma or great-grandma, I own a classic ’57 Chevy,” a guy who works in a firehouse and who’s seen offering baked treats to his buddies at work. The show has a weird three-act structure, with everyone baking three different, individually judged dishes over the course of the episode, after which Hollywood and Vallaroid weigh the outcomes and make a judgment call about who is the week’s top winner and who deserves to go home. Since it’s possible for someone to do terribly in one contest and smashingly in another, it ought to generate some suspense. “When I say ‘American pie,’” says Jeff Foxworthy, who has just said “American pie,” “I’m not talking about the movie. I’m not talking about the 19-minute song.” For CBS, those are topical references. Even worse for Jeff Foxworthy, that’s apparently a joke.